Scud-A, originally designed and manufactured by the Soviet Union in 1955 based on the design of the German V-2 rocket, was intended to carry a nuclear warhead as far as 190km. The Scud-A was designed to carry a nuclear warhead, as the original Scud was highly inaccurate, with a CEP of 3km. 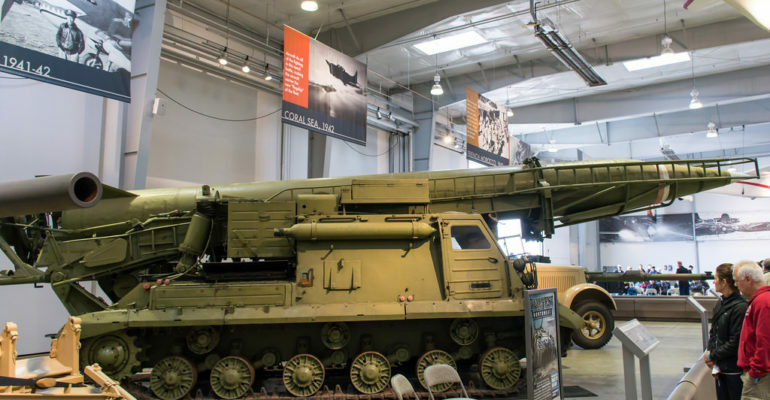 Despite its relative inaccuracy, the Scud-A gave the Soviet military considerable tactical nuclear capability. The Soviets initial attempt to reverse engineer the V-2 was called the R-1, which entered production in 1948. At first, the R-1 was not popular among the Soviet military. It was highly inaccurate, and it required cryogenic fuel that had to be kept at low temperatures. As fuel technology progressed in the early 1950’s, cryogenic fuel was no longer required, leading the Soviets to develop the R-11, a larger and more accurate missile. The biggest development for what would become the Scud was that nuclear warheads became small enough to be fixed on the missile. Scud-A was the first generation of Scud missiles, which became the most proliferated ballistic missile in the world. This was made possible during the Cold War, when the Soviet Union exported Scud missile variants to numerous countries. The Scud-A was not a very accurate missile, but it was the first ballistic missile capable of carrying biological, chemical, and nuclear warheads. The upgraded variant of the Scud-A, the Scud-B, was heavily exported by the Soviet Union during the Cold War. The missile’s proliferation was later compounded when North Korea exported the Scud design and components to countries such as Egypt, Iraq, and Yemen.